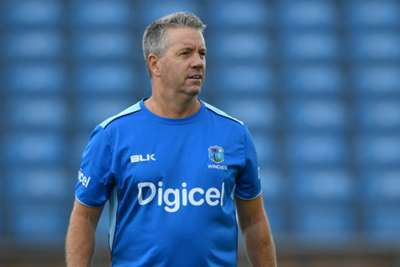 West Indies coach Stuart Law has been suspended for two upcoming one-day internationals against India after breaching the International Cricket Council's (ICC) code of conduct. Law was found guilty of Level 2 Article 2.7 of the code, relating to "public criticism or inappropriate comment" after addressing the umpires following Kieran Powell's dismissal in Sunday's Test defeat to India. The Windies coach admitted the charge on Monday and has now been fined 100 per cent of his match fee and handed three demerit points. As Law had already received one demerit point during the May 2017 Test against Pakistan, he has been banned for two of the five ODI matches against India. Law will depart the West Indies set-up after the December tour of Bangladesh to take up a coaching role with Middlesex.